Following the take-off of Ghana's decentralization policy in 1988, planning has changed from a centralized system to a decentralized approach aimed at placing communities at the centre stage of development through the formulation of district development plans. 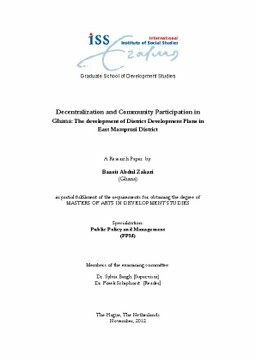 This study explores the spaces for community participation in the formulation of District Medium-Term Development Plans (DMTDPs) in the East Mamprusi District to ascertain the extent of community participation in the plans formulation. It highlights the perceptions of citizens on these spaces and the mechanisms for their involvement, and how they perceive their actual involvement in these spaces. Furthermore, it identifies relevant constraints to community participation in the DMTDP formulation for the district.